Can't see your item in shopping cart? Click here! Our basic terry velour robe is anything but basic! Made from terry velour which is smooth like velvet on the outside and looped for absorbency. Cotton Palace is pleased to offer personalization on most of our items. ALL PERSONALIZATIONS ARE ON THE LEFT CHEST (above breast pocket - if there is one). 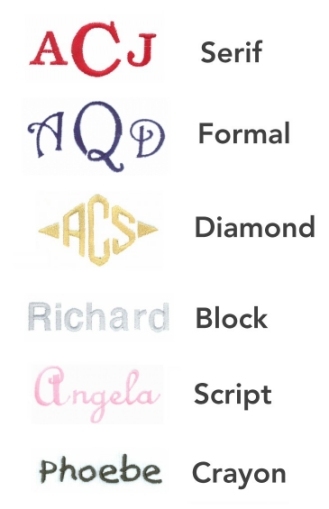 When requesting a three initial monogram it is customary for the middle letter to be the last (family) name. Thus if the name is John P. Smith, you must type JSP in the name/initial area. To be clear, make sure the middle letter you type is the middle letter you want on the embroidery! Please also note that the center initial will be larger- as shown in the pictures. Some monogram styles are not available for some robes. PERSONALIZED ORDERS TAKE APPROX 7 BUSINESS DAYS TO SHIP AND CANNOT BE RUSHED. On or about the seventh business day the item(s) will be shipped by the shipping method you choose. All images and text are copyrighted and may not be used without permission.